Lake liners are normally used for water containment in lakes that are several acres in size. Lakes can be a very beautiful part of nature as well as help nurture life to much of its surroundings by offering a very substantial water source. Many times these lakes need to be protected from losing large amounts of water. Often water in a lake can leak into the ground quickly without putting the proper containment precautions in place. Ensuring that water in lakes can be contained efficiently and cost effectively, lake lining is often an excellent choice to prevent large water loss. Lake Liner projects are usually considered to be a large undertaking. Because of this, only the largest geomembrane liner manufacturers can tackle the scale of large lake lining projects affordably and efficiently. With Western Environmental Liner’s state of the art factories & experienced staff, we can produce large amounts of custom fabricated lake liner panels in a short time and can offer turnkey installation as well with our many installation crews. Being one of the largest fabricators of lake liner materials and large pond liners, we also have economies of scale and purchasing power of raw goods unmatched in the industry which we pass onto you. 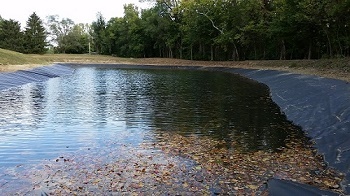 Western Environmental Liner provides many different lake liner options to fit the budget requirements of each lake project and will work with the project manager to ensure the most affordable option is provided. Please contact Western Environmental Liner for your Lake Liner needs.